Champagne tastes better in a flute! The flute has lost favour with wine lovers as well asÂ some experts as a vessel forÂ serving champagne. 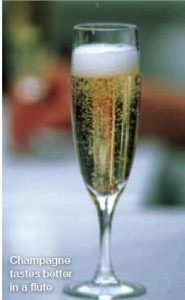 MostÂ people agree that the fluteâ€™sÂ shape is ideal for preservingÂ the bubbles but the aromasÂ get lost if you canâ€™t swirlÂ the champagne like with aÂ fine still wine to release itsÂ bouquet. Others disagree. 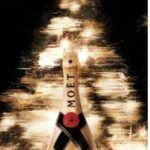 My own view is thatÂ aesthetics make a difference and theÂ flute is far more elegantÂ for drinking champagneÂ than a white wine glass.Â The fluteâ€™s association withÂ champagne makes it tasteÂ better and outweighs otherÂ considerations. with its delicate creamyÂ is for you. Rs 1,120. 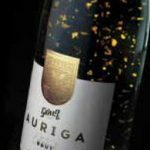 GROVER ZAMPAÂ VINEYARDSâ€™ AURIGA:Â A new release, Auriga,Â pictured, adds aÂ little extra oomph to yourÂ celebration with its dustingÂ of gold flakes and fresh noseÂ of citrus and floral aromas. RsÂ 1,550.